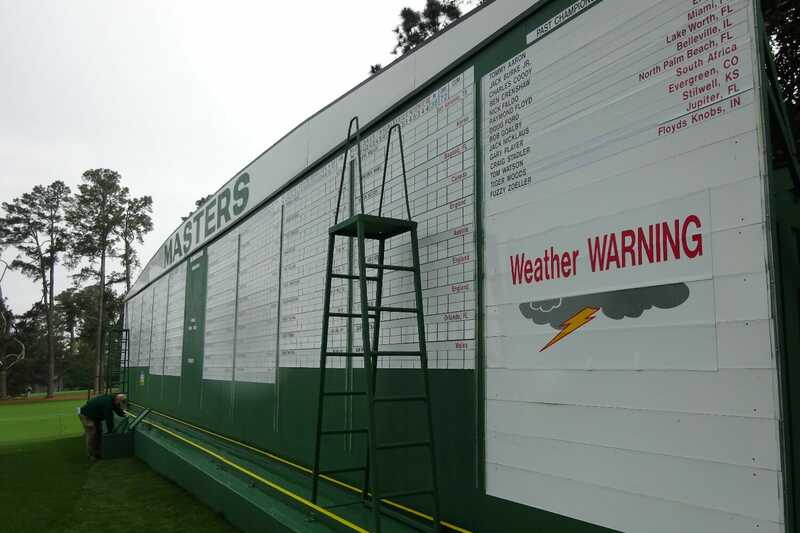 Patrons at Augusta National have been left short-changed and ticket touts have been left holding practice day tickets with the weather playing havoc with this year’s Masters. In total over the three days of official practice, there were five weather delays, with two of those evacuation warnings for players to leave the course and patrons to leave the premises. On Monday there were two delays due to the threat of lightning but near 3pm local time officials sounded a tornado warning that fortunately just missed the course, however it left a trail of destruction less than a mile away at the northern end of Washington Road. Then yesterday just 26 of the 94 competitors got to tee-up in the annual Par 3 Contest as it was abandoned. Missing out on teeing-up was Masters hot-favourites Dustin Johnson and Rory McIlroy and Jordan Spieth also missed out, while the most holes anyone completed was seven as 2003 Masters champ, Mike Weir, who was three under as played was halted. The weather forecasters say that should be the last of the bad rain but the wind is scheduled to pick up for today and Friday with gusts of up to 30mph certain to reap havoc with the opening rounds scoring. For Saturday and Sunday it looks like back to normal with calm conditions and temperatures in the mid 20s. One thing that is very noticeable this year is the lack of colour. Given the warmer-than-normal winter Augusta enjoyed there’s a lack of flower power on the course. It would be fitting in a year where the colour of choice is green that Rory or Shane claim the first green jacket for the emerald isle.